It all started when I overheard Guy Fieri talking about Danny's All-American Diner on the Food Network. It looked like a great spot for photos + delicious burgers so we made plans to stop there on our next trip to Tampa. Long story short: we had lunch, food was good, snapped a couple pics, but then a mural at a nearby gas station wound up being an even better spot for photos. (And that's how your dress earns the nickname gas station gingham! 😜) But really, the retro vibe of this dress is SO CUTE that I've already worn it twice. And I love how the long length balances the cut-out details on top. (The top also converts for more coverage.) 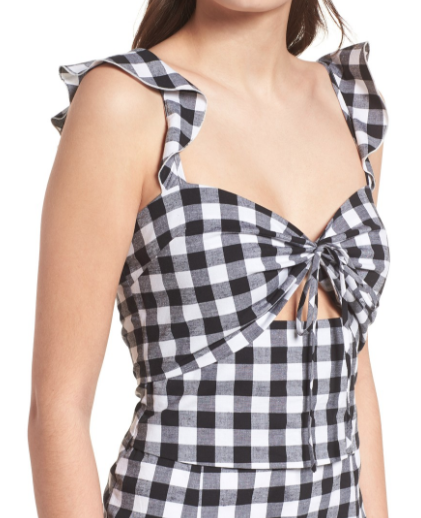 I rounded up more gingham dresses in case you dig this vibe but prefer something work-friendly or in a different shape, check it out below! Approx. dates: Shoes, purse, hat are 2 years ago. Dress is new. The top of my dress is convertible! The middle part unties, and then you can simply tuck the strings behind the panel for a new look.